Agents of the US Central Intelligence Agency, CIA, do not use torture on detainees, the agency's chief has told a Senate committee in Washington. "Torture is not productive," Porter Goss said. "That's not professional interrogation. We don't do torture." 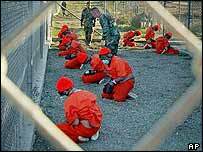 But he refused to say whether all methods used for interrogation until last year conformed to US law. The CIA is investigating at least four cases in which agents may have been involved in the death of a detainee. Mr Goss was testifying before the Senate Armed Services Committee. Sen John McCain, a Republican and a former prisoner in Vietnam, questioned the lack of a policy governing what interrogators can and cannot do when questioning prisoners. Mr Goss said officials did not view torture as a method for gaining vital intelligence, even though there had been "some uncertainty" among some CIA agents about approved interrogation techniques in the past. He said the uncertainty had been resolved and CIA employees were "erring on the side of caution" when choosing which method to resort to. "At this time, there are no techniques, if I could say, that are being employed that are in any way against the law or would be considered torture," Mr Goss told the public hearing. "Are you able to tell us today that there were no techniques being used by the intelligence community that were against the law... up to the end of 2004?" asked Senator Carl Levin, a Democrat. "I am not able to tell you that," Mr Goss said, offering to discuss the issue further at a later closed-door session. Mr Levin also said there was growing impatience over the outcome of the CIA's investigation into deaths in custody. "This is a huge missing piece," he said. To date, the CIA inspector general has referred one case to the justice department for prosecution, resulting in assault charges against CIA contractor David Passaro. He is accused of repeatedly beating an Afghan, Abdul Wali, while interrogating him at a US base in northern Afghanistan. Mr Wali died the day after the alleged beatings in his cell. Mr Goss also defended the US practice of extraditing terror suspects to face trial in countries with questionable records on human rights. America, he said, had been carrying out such "renditions" for 20 years, with 100 detainees transferred to such states as Egypt and Saudi Arabia. "I know of no instances where the intelligence community is outside the law on this," the CIA director said. The White House separately insisted that assurances were always received from countries receiving suspects that they would not be tortured. "The president has made it very clear that we do not condone torture... and the president does not believe we should export torture," said press secretary Scott McClellan.